The RUD Group has been providing customers with a comprehensive range of the world’s highest quality round steel link chain products. Lifting and lashing chains and components which offer superior wear resistance and provide multi-directional load and lift options. Tyre protection and traction chains that protect tyre treads and sidewalls on earth moving machines from damage and sudden-death failure. Modular conveying and hoist systems based on calibrated and highly wear-resistant round steel link chains. Engineering Design and Certification (design, manufacture and certification). RUD has ISO9001 quality system certification, and is renowned for its expertise in heat treatment methods- delivering high performance chain products to suit the most demanding applications. Usha Martin is one of the largest manufacturers of wire ropes in the world and leading specialty steel manufacturer in India. With a history of more than 50 years, the company has a global base of wire rope manufacturing with facilities located in India, UK, Dubai, and Bangkok. With a philosophy that quality ropes are made from quality steel, the company set up specialty steel plant in 1974. The plant uses high quality iron ore and coal from captive mines enabling it to achieve high consistency in raw material quality and hence a consistent quality of steel products. The company’s vision is “To be the global leader of the wire rope industry and the leading specialty steel manufacturer in India, by delivering customer delight, adopting modern technology and ensuring sustainable, inclusive growth for all of its stakeholders. 3M Fall Protection is a leading designer and manufacturer of fall protection equipment – specialising in height safety, confined space access and industrial rescue equipment. At 3M we rigorously test our safety systems, which include fall arrest and prevention systems, to exceed industry standards worldwide. Our world-class support means you’ll receive the best training, technical assistance and customer service in the business. Our commitment to safety drives us to continue to innovate across technologies, disciplines, and industries to help keep workers safe and protected to deliver our mission of: “Helping workers return home safely and live healthier lives”. Ronstan’s end-to-end design, manufacture and distribution operation delivers high specification rigging hardware for marine and tensile architecture applications. Firmly positioned in the epicentre of the rigging world, Ronstan understands how cables and rods can be combined in uniquely aesthetic designs that provide game-changing utility, structural efficiency, and meaningful sustainability. The Lankhorst name has been around since the early 1800’s and is synonymous with quality product and high level service. Lankhorst Euronete Australia specialise in providing high quality rigging and lifting equipment and high grade European synthetic ropes and nets. By making a range of high performance products and a wealth of expertise accessible, Lankhorst provides its customers with industry leading products and a valued partner. Our expertise on a variety of applications and knowledge of local and worldwide conditions offers customers top quality product and service. Lankhorst Euronete Australia is part of the Wireco Worldgroup with 57 branches throughout the world. Allan Marketing Group is an Australian Company that has been designing and developing its own brand of hoisting and lifting equipment for the Australian and overseas markets for 18 years. Our product range is quite extensive and covers most of the related products used in the Lifting, Rigging, Mining, Shipping, Construction and Transport Industries. Some typical products are lashing and loading equipment, load and lifting chain, shackles, slings and ratchet straps, hooks and wire cable products. All our products undergo a strict QC process involving checks and testing to ensure the products meet all the relevant Australian or International Standards before they are sold and suppled. Titan Lifting Technologies is a sister company to Allan Marking Group “AMG” importing agents for other products that they represent here in Australia. AMG commenced operations in 1998. Titan Lifting has been in the lifting – rigging industry over 35 years. Over 30 years’ experience working in this field in China. AMG developed high quality products produced with quality partner factories in China and elsewhere. Products marketed under our own Titan brand and generic brands internationally. – Countries include USA, Canada, Europe, UK, 4 Asian Countries, NZ, Pacific Rim and Australia. Focused on safety in lifting with products that conform to relevant International standards. With these years of knowledge in the industry AMG is able to source and supply bulk orders. Covering all bases of the transition of the goods from the supervision of manufacturing, direct freight delivery’s and all agents and customs clearances. AMG & Titan Lifting Technologies aims to provide high quality products to the lifting and rigging industry with safety as key feature to all its products. Backed by a team of experienced engineers and fully qualified trades people, Maxirig delivers high quality lifting equipment that aims to exceed the toughest Australian Standards. We believe the durability of our products to be second to none. To assist our customers with meeting their safety obligations each Maxirig. Townley Drop Forge specialises in the manufacture of tensioning, staying, lifting and rigging components and also offers a custom forging service for a wide variety of industries which includes mining, construction, infrastructure, automotive & marine. Established in 1913, Townley Drop Forge is one of Australia’s oldest and most experienced ferrous forging companies. 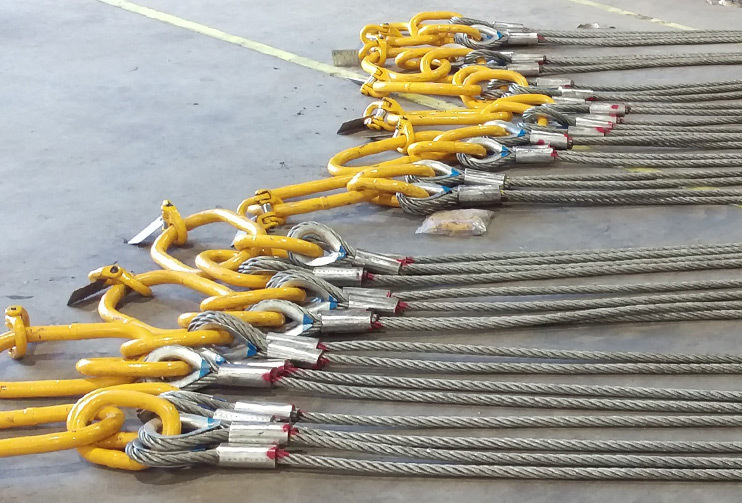 Since 1923, PWB Anchor has been recognised as Australia’s undisputed leader in the manufacture and supply of premium quality chain and lifting equipment. With a vast distribution network, extensive stock holdings and spare parts, PWB Anchor provides the total lifting package to industries unmatched Australia wide. Andromeda Insdustries is concerned with the manufacture of Superflex plaited steel cables and slings and sling assemblies, and woven steel cables used in the assembly of our range of Flat Woven Steel Slings. It also carries out the assembly of the Andromeda Recovery Strops. There are also a number of other divisions specialising in many areas. Contact us on 03 5144 1088 to discuss how we can provide a high quality, safe lifting or rigging solution for your project.